Hey, friends Missy here! 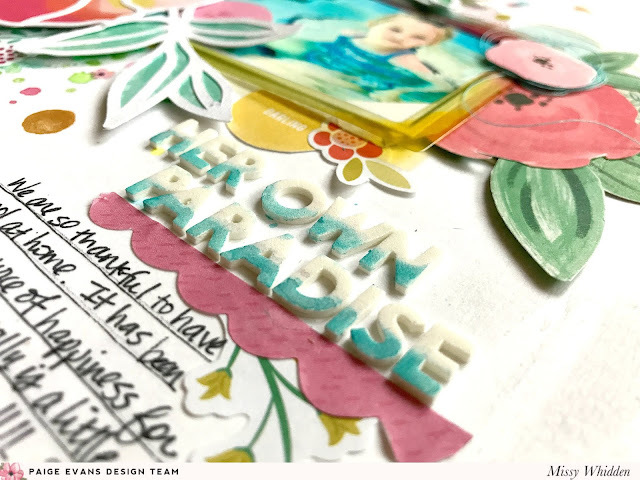 I decided to dig into some of my favorite papers that I’ve been hoarding from Paige’s Fancy Free collection. This was her very first collection with Pink Paislee and it’s still one of my faves. 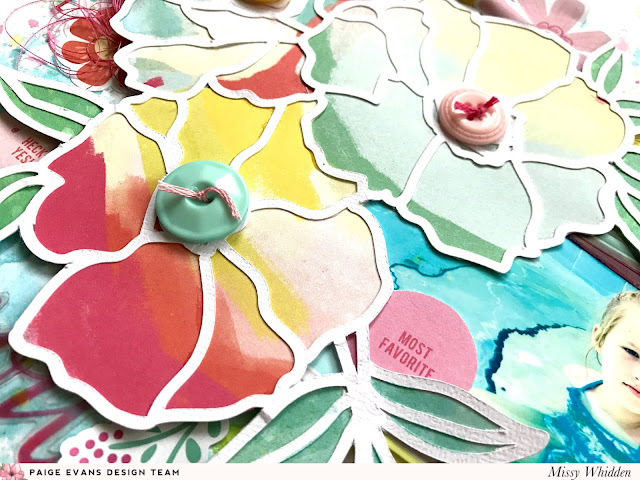 I began with Paige’s Poppies cut file and decided to go with a tropical feel. Sometimes I just make it work, and that’s what I did here. 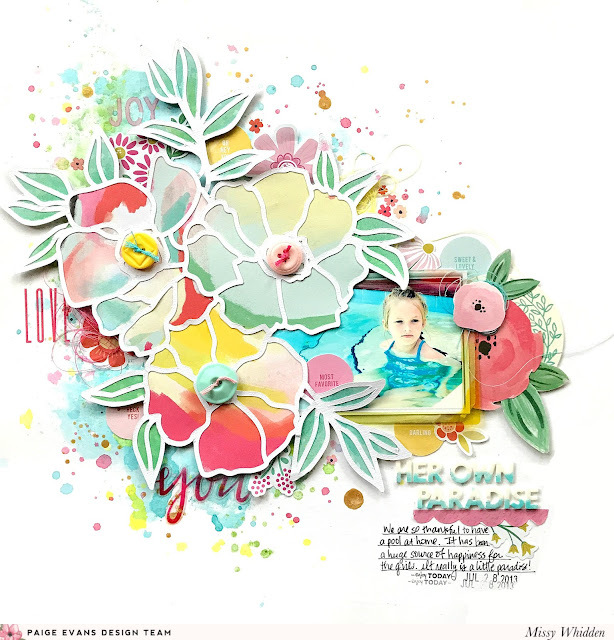 I absolutely love Fancy Free Paper 10. The colors and abstract design is just gorgeous and I used it to back the three large flowers. I used Paper 12, which is an aqua color, to back the leaves. I spritzed a bit of green ink spray on it to get a little bit of a color variation. I added a nice pop of blue with my pool photo. I love the tropical feel of these flowers. I added a Fancy Free Button to the center of each one with a bit of embroidery thread tied through them. I tucked my photo under the flowers and added even more flowers around the outer edge of the cut file. Most of those came from the 30-page Paige Evans #StickerBook. I also fussy cut some of the fun circle phrase pieces from the Fancy Free 6x6 Paper Pad and used those in a few spots. I used some of the white Pick-Me-Up Mini Thickers for my title and I added some blue ink and a bit of gelato to the bottom to make them pop off the white background. I layered a few of the 30-page #StickerBook stickers under it. I fussy cut a few of the gorgeous Fancy Free flowers and added them to the right side of the photo along with some leaves and a Fancy Free Tag. Those flowers are from Paper 07. I added clear gesso to my white cardstock background first, and then came in with matching colors of ink spray. I used the packaging technique and added lots of splatters. I used a few of the acetate pieces from the Fancy Free Ephemera Die Cuts. Here and in a few other spots I added a few Pick-Me-Up Rub-Ons. Do you still have any of the Fancy Free collection? 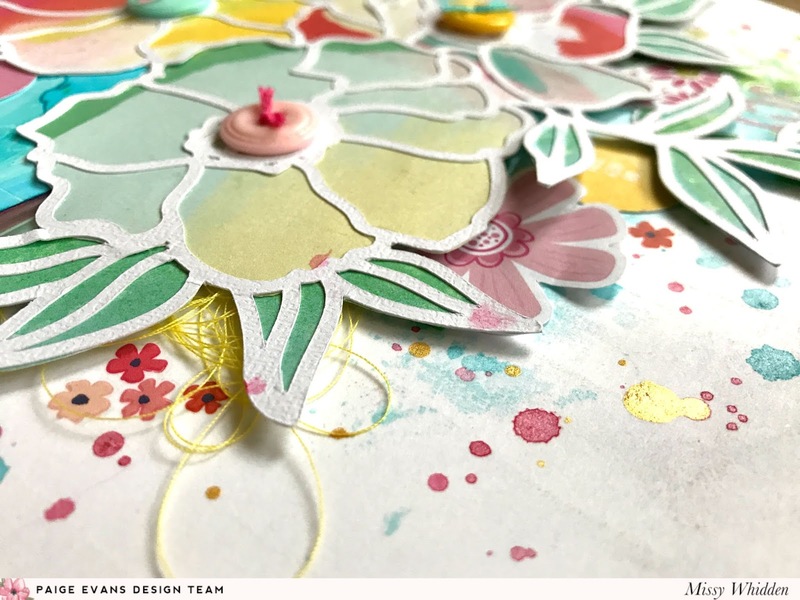 It was fun to revisit some of these beautiful papers and play with the embellishments again! I hope this inspires you in some way. Thanks for stopping by! This is soooooooo gorgeous! LOVING those flowers!!!!!! !